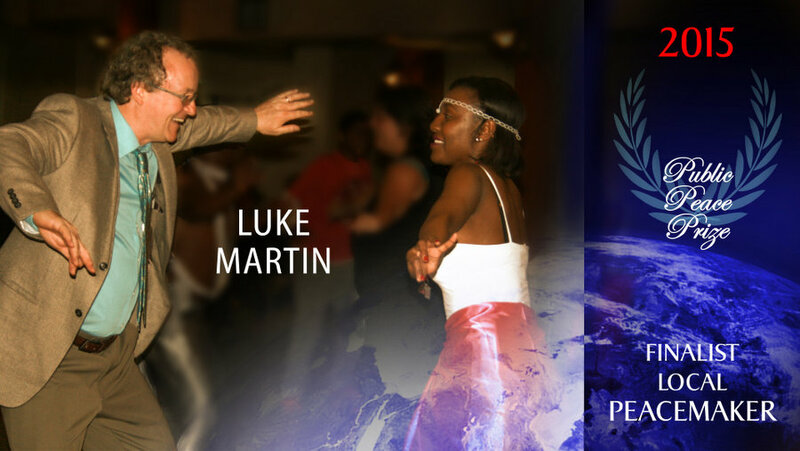 Building peace on a daily basis in an urban community requires mindful people with leadership skills that empower individuals at the grassroots level: Luke Martin is precisely this kind of peacemaker, who is fully dedicated to this mission. As a member of a Mennonite family he instills the values and attitudes rooted in a strong spirituality of peace and non-violence. In his current role as Executive Director of La Maison de l’amitié, (The House of Friendship) situated in a multicultural neighborhood in Montreal (Canada), he can share these values through his implication in a variety of community-based programs. He can be found participating in an annual Bike for Peace event (Vélo pour la paix), involved in a bi-weekly public Farmers’ Market, as a leading figure of the Greening Duluth Street project, or as director of Camp Cosmos, an inner-city, multicultural day camp, while vigilantly watching over the language courses offered to the immigrant students at La Maison de l’amitié. Wherever citizens are celebrating the diversity of multicultural life in Montreal, you will find Luke Martin, who is fully bilingual, sharing his vision and values trough partnership with other community organizations. He brings the support of La Maison de l’amitié and his personal leadership to the annual celebration of International Day of Peace, on September 21, which is organized annually with five other NGOs. Luke Martin is a compassionate man, a natural mediator and a local peace builder who is greatly appreciated by those who have an opportunity to meet him. La Maison de l’amitié is turning 40 this year, and his presence there is a gift to be celebrated as well.